If you are surveying for roofing materials, contact first an Airdrie roofing constructor in order to provide you with several options. The roofing contractor you meet with also need to explain the exact roofing materials you need against the materials they want to give you. Budget allocation also influences the final choice of the material to be used for roofing a structure. Daza roofing has the ability to get you the best price along with quality craftsmanship. Our Airdrie Roofing Contractors are truly masters of their trade. You can Rest assured that your roof will protect your family for years. 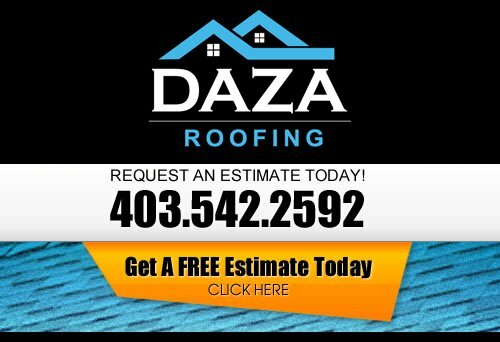 At Daza Roofing, our Roofing Contractor wants to be your Airdrie Roofer. An average roof under normal stress has a life of approximately 15 years. This is however an ideal situation. During this lifetime there might be a few cases of leaks and moisture formation along the wall. These tell tale signs must be taken carefully in order to ensure that they don’t balloon into major causes of concern at a later date. Roofs are to be taken care of and treated like any other structure within a house. If a minor repair is not done promptly then it might lead to a situation where the entire roof might require replacement. As with all other Airdrie Commercial Roofing Contractors it is always advisable to try and find other companies he worked for and see the results, or at least have a short conversation with the business’s this contractor made earlier work on, when you are finalizing the details try and have some kind of paper of agreement that you can both sign and that will hold the basic understandings between you and the Airdrie Commercial Roofing Contractor. Need a new roof? If your living room or kitchen sports large buckets for catching rainy drips, the answer is probably “yes.” Assuming that you are unable or willing to replace it yourself, you will be looking for a reputable Airdrie roofing contractor to handle the job for you. Having your roof done is an important job. Don’t let just anyone tamper with your roof. It is an important part of your home’s structure, and only an expert should tackle needed repairs and updates. If you are looking for a professional Airdrie roofing company, then please call us today at 403-542-2592 or complete our online request form for a free estimate.